It's been 21 years since the release of the last original Kid Icarus game. That makes hero Pit old enough to drink. Let's see if the assembled game reviewers gave him reason to start. 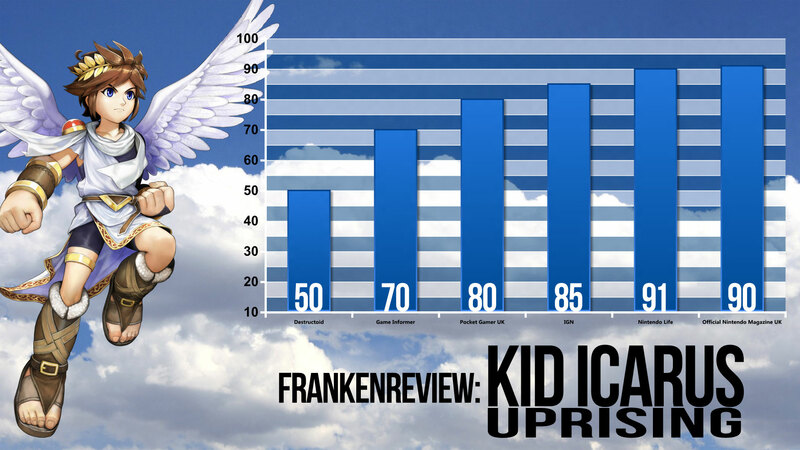 Kid Icarus: Uprising takes the original heavenly action-platformer from the NES days and transforms it into a third-person shooter. That sentence alone would send many a game reviewer running for the door. What door? I don't know what door. There's got to be a door somewhere they can run for. Unless they're in the middle of a field somewhere, or in an aeroplane. Oh god, I hope they weren't in an aeroplane. What were we talking about? Kid Icarus: Uprising? I hear that's a funny game. Let's see how funny it is when the assembled game critics get done with it. 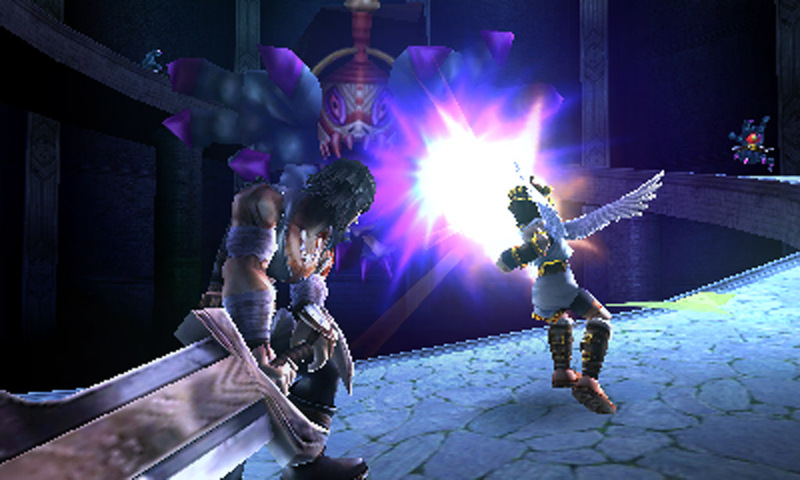 Of all Nintendo's classic franchises, Kid Icarus is one that has sorely been lacking in love, with protagonist Pit's failing to make even a playable Super Smash Bros. appearance until Brawl rolled around in 2008. However, that all changed when the 3DS was officially announced and Kid Icarus: Uprising made itself known to the world. With its unique control scheme and gameplay designed to show off the 3DS' always impressive visual trickery, Uprising tries to make good on Nintendo's promise of innovative handheld gameplay and graphics that can make jaws drop. However, to do that, you need a plastic stand that comes shipped with every copy of the game. On that note, all I can say is that if your handheld game needs a static add-on in order to make it less unbearable to play ... you might have a problem. 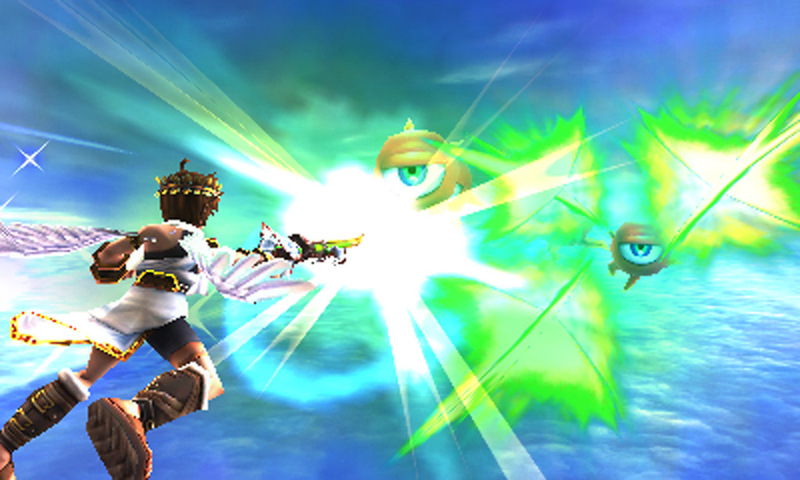 Many of the game's enemies and locations are updated versions of Kid Icarus' familiar (and otherwise) foes. 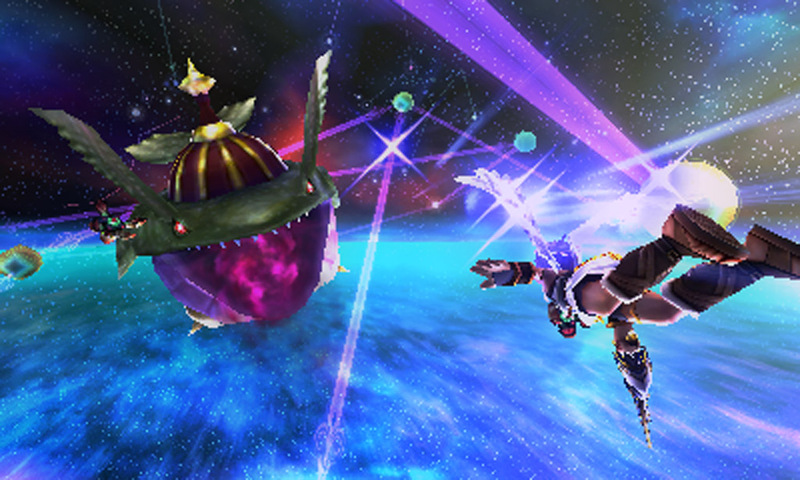 Eggplant Wizard is back, though to my relief he won't have you running in search of a cure for eggplantism. It's a great blast of nostalgia, especially when coupled with the excellent score, which takes some of the game's classic themes and twists them in unexpected directions. 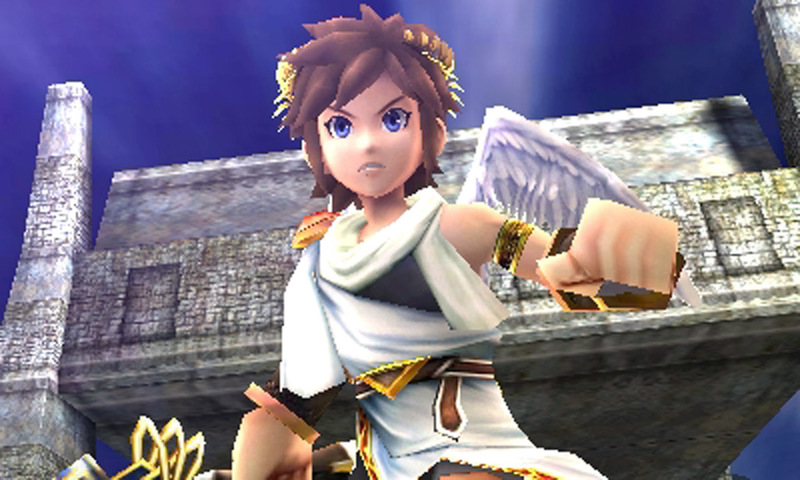 Pit was something of a cipher in the original, and here he's fully fleshed out as a plucky optimist. I thought he was obnoxious at first, but his enthusiastic approach and humour grew on me over the course of our adventure. Chapters are 30-minute chunks of action split into two distinct parts. Each level opens with Pit leaping skyward to do battle with the underworld forces in rail shooter fashion before landing on solid ground five minutes later to proceed on foot. The aerial sections offer some of the most impressive draw distances and 3D available on the 3DS's stereoscopic display, with glistening oceans, twinkling stars, and epic battlefields that stretch for miles the more you adjust the 3D slider upward. The ground segments, meanwhile, are drawn-out hack-and-slash affairs, as you move through waves of underworld fodder toward the boss awaiting your arrival. It's here you'll get down to the nitty gritty of the combat system. While fundamentally sharing the same goal - kill everything in sight - Uprising's airborne and ground-based gameplay settings are significantly different experiences, not only in concept but control. 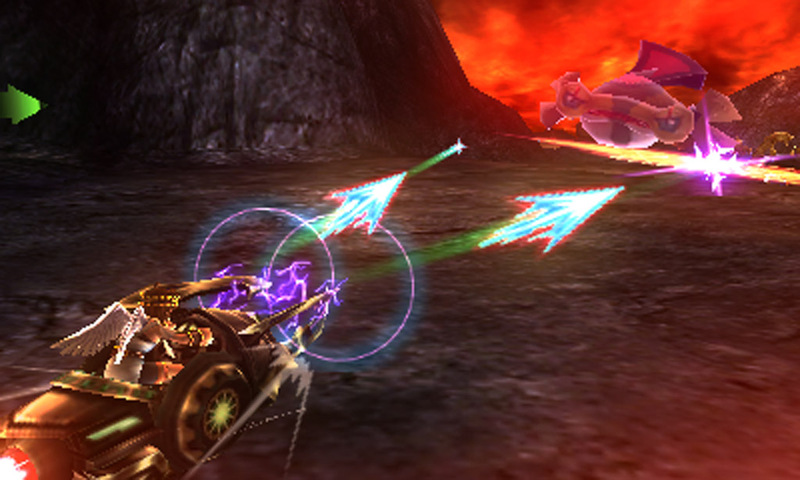 In the air, players will control Pit's aim and physical position, but his actual forward momentum is automatically determined. While on rails, this allows players to focus on shooting and manoeuvring through the forces of evil. Though we've seen other games do this, including Nintendo's Star Fox series, the developers here manage to create a sense of breathtaking speed, and then combine that with some incredibly diverse and stunning world designs. While its characters and creatures might not be as technically impressive as something like Capcom's Revelations, Uprising's artistic creativity stands right alongside Mario 3D Land as some of the best material seen on the 3DS thus far. The simplicity of the air segments help them greatly. They maintain focus. They never try to do more than they should, and therefore are consistently impressive. On the ground, Uprising struggles a little more. By default, the control scheme requires the use of the Circle Pad to move Pit, and the stylus to not only aim but manoeuvre the camera as well. As you might imagine, holding a 3DS in one hand is not exactly comfortable. To Project Sora's credit, Uprising has more options, settings and control variables than just about any other portable game out there. Left-handed support is ample, and players can even reassign buttons liberally, tuning just about every element they can imagine (short of dual analogue support with the Circle Pad Pro, which is not implemented). While the Solo Mode is the cinematic and most significant part of the title, there's online multiplayer too. With support for local and worldwide play these are land battles set within specially designed arenas, with unbridled chaos the order of the day. Free-for-all is exactly as you'd expect: up to six players going all-out for themselves, with the gameplay quickly descending into madness. The camera control with the stylus, while less of a problem in the structured single-player levels, can be troublesome when fire and enemies are coming from all sides: not a deal-breaker, but worth bearing in mind. Light Vs. Dark is the team event, and in our view the more enjoyable mode. Two teams of three compete, each with a team life-bar: once that bar depletes one member becomes an angel, and the first team to destroy their rival's angel is the winner. This online functionality does lack an overall ranking or rating system for your profile, but the short bursts of action, combined with the rewards of hearts and weapons, makes it a fun option. We didn't experience any noticeable lag or waiting times for a match, with the game cleverly adding bots to fill spaces when needed, then promptly replacing them with real players in time for the next round. It may not be a fully-tooled online multiplayer component, but it's quick and entertaining. Uprising dances a merry jig along the thin line between rosy retro-reverence and modern and contemporary gameplay mechanics, utilising almost all of the 3DS's features while drawing heavily from its heritage. A rich cast of strange characters stars in a deceptively lengthy solo campaign (with more than a couple of twists and jaw-slackening revelations), while a solid, fun and tactical multiplayer mode and near bottomless cache of gubbins to collect ensures huge replay value. In effect, it feels far bigger than the console upon which it appears, it's deeper than most home console titles and more content-packed than any other 3DS game yet released. Pit might've been sorry to keep us waiting, but this was a wait worth every second. Still pretty funny then. I guess I'll pick this up. I mean heck, what else am I using the DS for? Seeing as you could almost order those review scores by trustworthiness, with destructoid being the by far the most trustworthy, I'm going to guess that Kid Icarus is not the reason to buy a 3DS I hoped it was. I thought so too, but then 1up awarded it a B+. All the reviews I've read make the point that controls are sub-standard in this game, but certain reviewers are willing to let other aspects of the game outshine their sore wrists. The friendly banter presented by Stephen Totilo and... the other Kotaku guy I can't remember off the top of my head has convinced me to get this game. It's kind of funny. The Smash Bros guy who made this virtually admitted at the beginning that the control scheme sucked, and openly ranted that the circle pad pro came too late to implement a new scheme, but seemed to pour his everything into the title to make it appealing even though the controls aren't ideal. 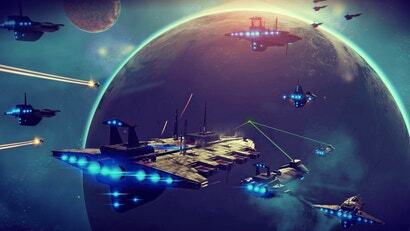 It might not be a system seller, but I have no doubt it will be an interesting title and certainly is worth picking up at launch. I find the 1up review quite strange. Honestly - for my money, a poor control scheme is inexcusable at this point. It should be treated as an instant fail. People aren't just saying its painful for wrists - they're saying the character is basically uncontrollable when on foot. To use the excuse that the circle pad pro came out too late makes no sense - they made the control scheme for the base device and completely fumbled it. I haven't played the game obviously, but based on reviews, I can't understand how the game can get higher than 50% when by all accounts more than half the game is wretched. By this logic there should be 0 games on the ipad. Anyway, from what I can understand destructoid's idea of a 5 out of 10 is a lot different from other pages idea. Comparing one review score to another is pointless, because the important issue is whether or not they made their case in the body of the review. With regards to the Mariokart review, they clearly make their case for a score of five. I realize there are some passionate fans of the series who liked the new additions and enjoyed the hell out of the game. That's fine. There are also people like me (and that destructoid reviewer) who believe that the Mariokart series has had a number of issues, particularly with balance and items, to make it basically the least fun game ever. The thing is though, thats a matter of taste. Its not surprising that some reviewers might give a mostly well-received game a low score under such circumstances. When it comes to controls though, thats an objective issue. There might be some subjectivity as to how bad they have to get before we have to start marking down the game. 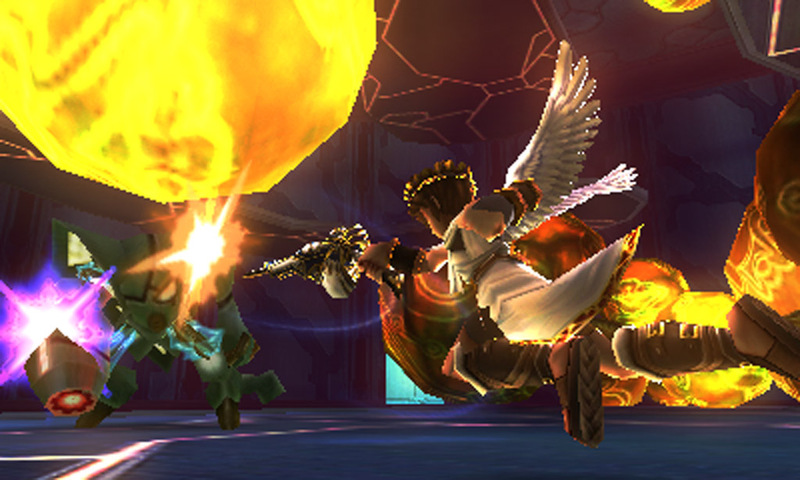 However, judging my the reviewers of Kid Icarus, they are exceptionally, unplayably bad. I don't understand how a reviewer can say that and then give it a good mark for other features. It doesn't matter if the game has a lot of positives, because they can't really be enjoyed if they fail on that measure. Therefore, it deserves a low score in much the same way a great game that is unplayably bug-ridden deserves low marks. Looks like ninty getting a free pass again. If the control scheme is poor then i agree it should be slammed. its on a handheld device. if i cannot comfortably play it on the train without a stand or addon then whats the point? I bought zelda oot because I love the game and having it portable was great. However nothing else has come out worthy of buying. im playing DS game on it... Lylat wars was not worth it imo. 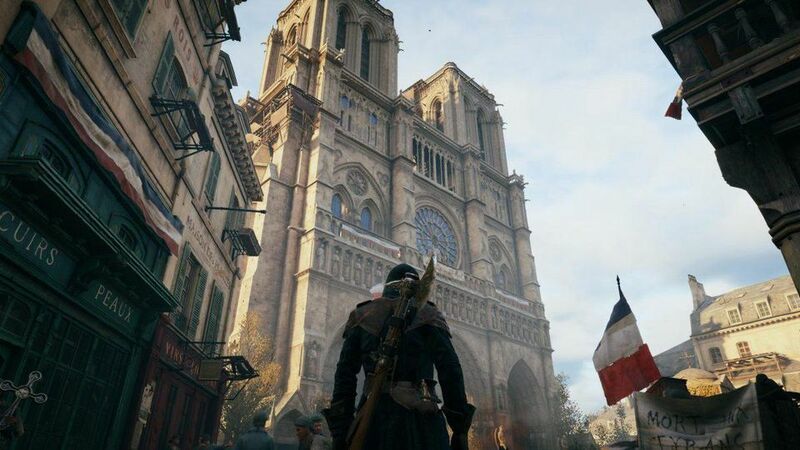 The game is super short and the lack of online burned it for me. 1. It isn't Kid Icarus. It's themed after Kid Icarus, and that's really the extent of it. 2. Worst controls in any game I've ever played. Not joking - just downright the worst goddamn controls I've ever experienced. Oh, almost forgot to mention. The stand isn't there to justify the controls. It's because the play style makes using the system's 3D screen near impossible, unless the system is totally stationary. Good job with those legendary design skills, Ninty. lol... 50 from destructoid? Is this Sterling trolling for page hits again? **checks..** Oh look, it is our rotund friend. I thought the game was a bad idea when they announced it. Destructoid blocked here at work, so I can't actually go check... but am I to assume the review score is more about the craptastic plastic stand than it is about the actual game? The control scheme isn't ever THAT bad, and my hands only noticeably 'strained' after playing for like, 30 mins non-stop. It's not as bad as some are making it out to be. And they've been SIGNIFICANTLY improved since the Demo units that Nintendo had around the place last year and whatever. I don't know how you play, but when I play it, the 3D effect works very well. FYI I'm not making large gestures constantly as I play.